For other uses, see Crisis (disambiguation). "Crises" redirects here. For other uses, see Crises (disambiguation). Look up crisis in Wiktionary, the free dictionary. 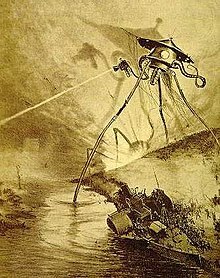 The alien invasion in War of the Worlds was a fictitious crisis. Crisis is often linked to the concept of psychological stress. In occidental culture, the term is often used to suggest a frightening or fraught experience while in oriental cultures like China it means danger and opportunity (Chinese characters used are Wei and Chi). In general, crisis is the situation of a complex system (family, economy, society) when the system functions poorly, an immediate decision is necessary, but the causes of the dysfunction are not immediately identified. the causes are so many, or unknown, that it is impossible to take a rational, informed decision to reverse the situation. Venette argues that "crisis is a process of transformation where the old system can no longer be maintained." Therefore the fourth defining quality is the need for change. If change is not needed, the event could more accurately be described as a failure. Apart from natural crises that are inherently unpredictable (volcanic eruptions, tsunami etc.) most of the crises that we face are created by man. Hence the requirements of their being 'unexpected' depends upon man failing to note the onset of crisis conditions. Some of our inability to recognise crises before they become dangerous is due to denial and other psychological responses  that provide succour and protection for our emotions. A different set of reasons for failing to notice the onset of crises is that we allow ourselves to be 'tricked' into believing that we are doing something for reasons that are false. In other words, we are doing the wrong things for the right reasons. For example, we might believe that we are solving the threats of climate change by engaging in economic trading activity that has no real impact on the climate. Mitroff and Silvers  posit two reasons for these mistakes, which they classify as Type 3 (inadvertent) and Type 4 (deliberate) errors. The effect of our inability to attend to the likely results of our actions can result in crisis. An economic crisis is a sharp transition to a recession. See for example 1994 economic crisis in Mexico, Argentine economic crisis (1999–2002), South American economic crisis of 2002, Economic crisis of Cameroon. Crisis theory is a central achievement in the conclusions of Karl Marx's critique of Capital. A financial crisis may be a banking crisis or currency crisis. An environmental disaster is a disaster that is due to human activity and should not be confused with natural disasters (see below). In this case, the impact of humans' alteration of the ecosystem has led to widespread and/or long-lasting consequences. It can include the deaths of animals (including humans) and plant systems, or severe disruption of human life, possibly requiring migration. A natural disaster is the consequence of a natural hazard (e.g. volcanic eruption, earthquake, landslide) which moves from potential into an active phase, and as a result affects human activities. Human vulnerability, exacerbated by the lack of planning or lack of appropriate emergency management, leads to financial, structural, and human losses. The resulting loss depends on the capacity of the population to support or resist the disaster, their resilience. This understanding is concentrated in the formulation: "disasters occur when hazards meet vulnerability". A natural hazard will hence never result in a natural disaster in areas without vulnerability, e.g. strong earthquakes in uninhabited areas. For lists of natural disasters, see the list of disasters or the list of deadliest natural disasters. An endangered species is a population of an organism which is at risk of becoming extinct because it is either few in number, or threatened by changing environmental or predation parameters. An endangered species is usually a taxonomic species, but may be another evolutionary significant unit. The World Conservation Union (IUCN) has classified 38 percent of the 44,837 species assessed by 2008 as threatened. For information about crises in the field of study in international relations, see crisis management and international crisis. In this context, a crisis can be loosely defined as a situation where there is a perception of threat, heightened anxiety, expectation of possible violence and the belief that any actions will have far-reaching consequences (Lebow, 7–10). In some cases, it is difficult for an individual undergoing a crisis to adapt to the situation. As it is outside of their normal range of functioning, it is common that one endures a struggle to control emotions. This lack of control can lead to suicidal tendencies, substance abuse, trouble with the law and general avoidance of resources available for help. One such resource used to aid an individual in crisis is their social support system, which can come in the form of family, friends, coworkers, or health professionals. It is important that a support system consists of people that the individual trusts. Although these support systems play a crucial role in aiding an individual through a crisis, they are also the underlying cause of two thirds of mental health crises. The aforementioned mental health crises can include marital issues, abandonment, parental conflict and family struggles. As aforementioned, a crisis to this day can be overcome by implementing mechanisms such as: sleep, rejection, physical exercise, meditation and thinking. To assist individuals in regaining emotional equilibrium, intervention can be used. The overall goal of a crisis intervention is to get the individual back to a pre-crisis level of functioning or higher with the help of a social support group. As said by Judith Swan, there's a strong correlation between the client's emotional balance and the trust in their support system in helping them throughout their crisis. The steps of crisis intervention are: to assess the situation based on behaviour patterns of the individual, decide what type of help is needed (make a plan of action) and finally to take action/intervention, based on the individual's skills to regain equilibrium. Moreover, another method for helping individuals who are suffering in a crisis is active listening; it is defined as seeing circumstances from another perspective and letting the other person know that the negotiator (the helper) understands their perspective. Through this, they establish trust and rapport by demonstrating empathy, understanding and objectivity in a non-judgmental way. It is important for the negotiator to listen to verbal and non-verbal reactions of the person in need, in order to be able to label the emotion that the individual is showing. Thus, this demonstrates that the helper is tuned in emotionally. Furthermore, there are other techniques that can be used to demonstrate actively listening such as: paraphrasing, silence and reflecting or mirroring. The goal in active listening is to keep the person talking about their situation. When the control parameter of a chaotic system is modified, the chaotic attractor touches an unstable periodic orbit inside the basin of attraction inducing a sudden expansion in the attractor. This phenomenon is termed as interior crisis in a chaotic system. ^ Henry George Liddell; Robert Scott. κρίσις. Perseus: A Greek-English Lexicon. ^ Bundy, J.; Pfarrer, M. D.; Short, C. E.; Coombs, W. T. (2017). "Crises and crisis management: Integration, interpretation, and research development". Journal of Management. 43 (6): 1661–1692. doi:10.1177/0149206316680030. ^ Seeger, M. W.; Sellnow, T. L.; Ulmer, R. R. (1998). "Communication, organization, and crisis". Communication Yearbook. 21: 231–275. doi:10.1080/23808985.1998.11678952. ^ B. Wisner; P. Blaikie; T. Cannon; I. Davis (2004). At Risk – Natural hazards, people's vulnerability and disasters. Wiltshire: Routledge. ISBN 0-415-25216-4. ^ a b c Lanceley, F. J. (2003). On-Scene Guide for Crisis Negotiators, Second Edition (2nd ed.). London: CRC Press. ^ a b Woolley, N (1990). "Crisis theory: A paradigm of effective intervention with families of critically ill people". Journal of Advanced Nursing. 15 (12): 1402–1408. doi:10.1111/1365-2648.ep8529911. ^ a b Nursing Best Practice Guideline: Shaping the future of Nursing. (Electronic book). Appendix C - Assessment of coping skills and support systems. (Page 53). Executive Director: Doris Grispun, RN, MScN, PhD. Date: August 2002. ^ Vecchi, G. M. (2009). Conflict and crisis communication. Annals of the American Psychotherapy Association, 12(2), 32-29. ^ Swan, J., & Hamilton, P.M. (2014). Mental health crisis management. Wild Iris Medical Education, Inc.
^ Registered Nurses’ Association of Ontario. (2006). Crisis intervention. Toronto, ON: Registered Nurses’ Association of Ontario. Jäger, Johannes. "Crisis" (2012). University Bielefeld - Center for InterAmerican Studies. Lebow, RN, Between Peace and War: The Nature of International Crisis: 1981. The Rancho Bernardo Hopkins University Press, ISBN 0-8018-2311-0. Takis Fotopoulos: "The Multidimensional Crisis and Inclusive Democracy" Special Issue, "The International Journal of Inclusive Democracy", 2005. Rüdiger Graf, Konrad Jarausch. “Crisis” in Contemporary History and Historiography in "Docupedia Zeitgeschichte", March 27, 2017.